As I sit down to type this post, it's a bittersweet feeling to think that another year just flew by, but at the same time, I'm excited for this season and all that it will bring. 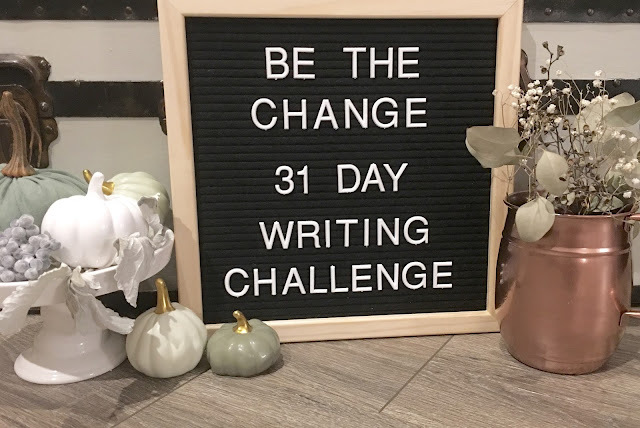 This year, for the 31 day writing challenge, they opened up a new way to participate via Instagram. I knew immediately that this was the group that I would be apart of. There will be a few posts that I will link up to my blog, but most of my content for this challenge will be posted each day on my Instagram page, the.erin.elizabeth. I think that by providing this option, it allows others, who don't blog, to participate, and for those who do have a blog, it is a new challenge on top of the writing for 31 days. My topic this year is, Be The Change, and it's more than just being nice and kind. If I can be real, in my opinion, it doesn't take much to be kind to one another. I am sure for some people it may not be easy, but I think for most people, kindness should be apart of our every day routine, minus the bad days. I know we're not perfect! This change that I speak of, kindness does play a part, but it's actually doing something about the things we so wish were different in our society. It's putting action behind our words. Now, I understand that for most, we can't just pick up our lives and move across the country to do mission work, but what if I told you that you don't need to move to another country to God's work. There is plenty of stuff right here in our little towns that need a change. I hope that you will join me in this journey of exploring the many ways that we can be the change. I know for so long, I would pray to God and ask for Him to do something about a situation. I have finally realized that His response was the same every time, I just ignored it, and I believe that response is the same for most of us. He created us to be His hands and feet, to do something about areas where we want to see a change. Sure, there are plenty of things that are not meant for us to fix, but there are plenty of things where we can make a change! You can follow me during the next 30 days over on my Instagram page, the.erin.elizabeth. This is where I will create most of my posts. I will also have a direct link for each day's post here, if that's easier for you. And the best part of all, is that I am kicking off this challenge with my "5 days of Fall Favs" Giveaway. Staring tomorrow, Monday October 2, and running through Friday October 6th, I will post one of my Fall favorites to give away. Each day will be something different and you can enter each day. You must be following me on Instagram because that is how you enter!! All the details will be given via Instagram each day, and in order to be eligible to win, you will have to follow the rules posted there each day. Good Luck!